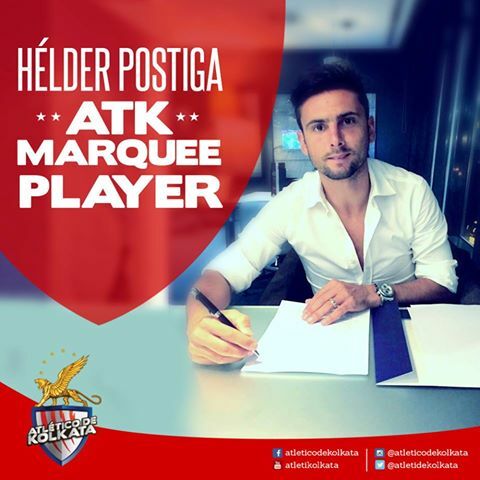 Atletico de Kolkata have signed Portuguese forward Hélder Postiga as their Marquee Player for Second Season of Hero Indian Super League. Postiga has represented Portugal in two FIFA World Cups and three European Championships. Hélder Postiga, 32, having played for the likes of Porto, Valencia, Real Zaragoza, Sporting Lisbon, Lazio and Tottenham Hotspur, will bring a lot of experience to the champions of the inauguration edition of Hero Indian Super League(ISL), Atletico de Kolkata. The Portuguese forward have a tally of 27 International goals to his name while donning the Portugal National Team Jersey. Mr. Sanjiv Goenka, Co-owner of Atlético de Kolkata said, "On behalf of the team management, we welcome Postiga in the Atlético de Kolkata family as our marquee player for 2015 season of ISL. Postiga’s sheer ability to score goals as a striker made us take notice and seal the deal. It will be an altogether different sight to see him charge with the ball and we believe he will win over the fans of the red and white brigade”. We have finally selected our 26 players and look forward to an exhilarating season ahead. We would also like to thank ATM for their support in recruiting the International Players." Antonio Habas, the Head Coach of Atletico de Kolkata said, "The presence of Postiga will definitely bolster the team for the season ahead and also allow the Indian and International players to learn from him about the way he goes about preparing for a major tournament like ISL. He will have an altogether different experience when he plays in front of Kolkata’s football aficionados. I am sure Postiga’s presence will make the city and ATK fans proud."